So you are in your local enjoying a drink with friends when suddenly one of your group collapses on the floor with breathing difficulties, the ambulance is summoned but in the meantime your friend suffers a cardiac crisis and stops breathing. A person trained in first aid is in the pub and more crucially, there is a defibrillator, and it is this piece of equipment that saves your friend’s life. It is therefore with great pride that Rotary District 1100, working with the Heart-Safe Community, can announce that the South Western Ambulance Service NHS Foundation Trust (SWASFT) team has won a national accolade for saving lives and creating heart-safe environments across the region. Join us in celebrating this success at Hatherley Manor Hotel in Gloucester on 26th February. Click here for details. More recently, a joint collaborative project with Gloucestershire Constabulary’s Police Officer Matt Hammond has been to install Automated External Defibrillators (AEDs) in licensed premises. Money was needed for the City Centre AED programme and, in typical Rotary fashion, a group of stalwart from a number of Rotary Clubs turned out on a cold wet day to hold a bucket collection during a Gloucester v France rugby match, raising more than £3000, which ensured completion of the City Centre AED project. Cleeve Vale Rotarian Colin Prottey paid tribute to Kevin, remarking: “Kevin Dickens has been the inspiration behind the various defibrillator projects within the SWAST area of operation for more than 10 years, installing AEDs in schools, colleges, sports clubs and in semi-rural communities throughout Gloucestershire, with financial help and additional involvement given by many other District 1100 Clubs, and where more than 40 AEDs have been installed”. 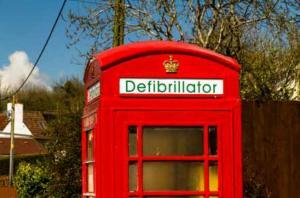 The UK Heart Safe Association has said it is committed to make this a national initiative. 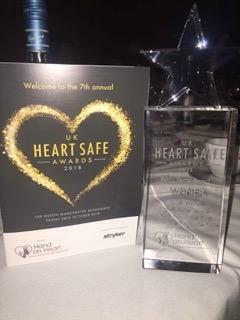 The Award recognises organisations, including local authorities and emergency services, that have invested in lifesaving equipment and staff training to provide heart safe environments for their employees and the public. A Heart-Safe environment is one where life-saving equipment, such as a defibrillator, and training are provided for staff or customers so that, should a sudden cardiac arrest occur, people are fully prepared to perform resuscitation and additional life support immediately. Creating Heart-Safe environments within the community is vital these days, with both financial and access pressures on the NHS and the Emergency services, particularly in semi-rural areas. Moreover, it is the raising of awareness in the community, particularly with young people, of what they need to do when faced with emergencies such as Sudden Cardiac Arrest in order to save a life! It is in this respect that Rotary Clubs in District 1100 are keen to add this vital support for the communities we serve.